As you already read I prepare my own sweet healthy treats during the weekend to have a healthy snack „on hand“ during the busy week. 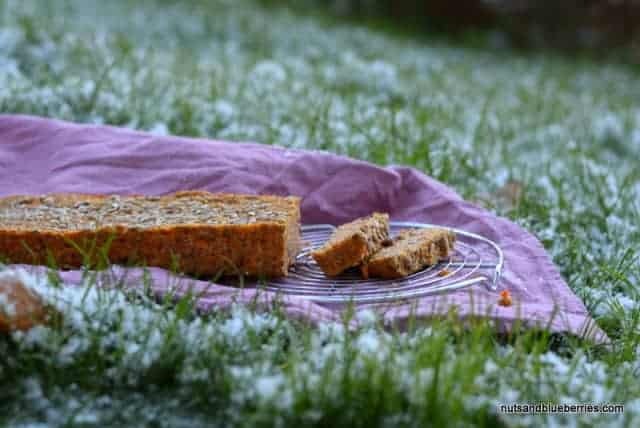 Last weekend I baked a carrot almond loaf with a sweet taste and enjoyed it during the week as a midday snack to give my body back energy for the rest of the day. I normally eat 4 times a day because I really love sweets. In the past I ate a lot of unhealthy stuff which contains lots of raffinated sugar. Since I don’t eat factory-made sweets any longer I feel really better. In the past I had the feeling I was hooked by sweets because I can’t stop eating them. Healthy eating is not eating no sweets. Its eating more whole grain food, more unprocessed food and the right treats. This carrot loaf is made with healthy carrots and almonds. Almonds are a source of many nutrients a fantastic source of many vitamins and Minerals. Along with almonds contribution to alkaline levels, it also has a high content of Vitamin E, which is a powerful antioxidant. Many people think that the word “fat” is negative, but in fact, certain fatty acids are essential, and can be very beneficial for overall health. Almonds are a very good brain food! They contains riboflavin and L-carnitine, nutrients that boost brain activity. A lot of reasons to integrate almonds more often in your diet. Right? I used buckwheat instead of grain flour in this loaf because buckwheat is really one of the healthiest food you can eat. It is one of the best source of high-quality, easily digestible proteins. Furthermore I used no raffinated sugar in this loaf. It is sweetened with rice syrup, a natural sweetener. Rice syrup is made with whole grain rice and contains all vitamins and minerals like zinc, magnesium and manganese. I have a lot of natural sweetener at home and I rice syrup is my new favorite. YEAH! Carrots and a little bit yoghurt make this loaf moist and you can keep it in the fridge up to 5 days. I use chia seeds instead of an egg. It is up to you if you like to make it vegan or vegetarian. Soak Chia Seeds in 50ml water for 10 mins (as egg replacement). Preheat oven on 200° degrees. Add buckwheat flour, ground almonds, grated carrots and the raisins with the baking powder and salt in a bowl. Mix the yoghurt with the rice syrup. Add the yoghurt-rice syrup with the chia seeds to the dry ingredients and stir well. Grease a mould and press the batter into the mould. Sprinkle the dough with sunflower seeds. Bake the bread for 12-15 min. until it became golden. Let cool down for 15 min. before serving. Enjoy it with Avocado, chia jam, honey or anything else.